Phew, I'm pleased I don't have to use Word again for a while, that was quite a formatting job ! I've uploaded the Army PDF to google docs, you can view it online by going to the Army list site below and download it too if you want a hard copy. 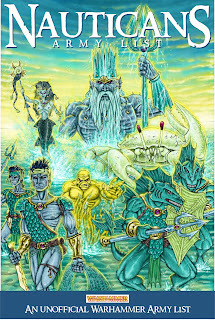 You can see the army list online here Nautican Warhammer Fantasy Battle army in case you ever want to check any of the rules and don't want to download the PDF at school / college / work. Note that there are a few differences in the wording between the online army list and the PDF (for formatting reasons) but all of the rules are identical.